I'm really glad to hear there is so much interest in a Mouse Guard Role Playing Game so far! 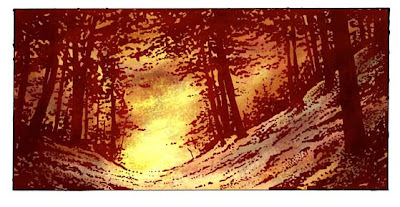 Luke Crane has been working really hard on making sure it is firmly rooted in not just the current Mouse Guard books, but doesn't undermine any future Mouse Guard stories and books. At the same time, Luke is making sure there is plenty of room for players to take their own paths and adventures that stray far away from my Mouse Guard. Unfortunately, I can't share too much more on the details or more artwork. In the past I posted sketches for the cover. Now the cover is finished and since that will be shown in any solicitation ad, I figured I could share that with you. It was really fun placing characters from Fall and Winter along side characters who have only been mentioned or ideas of characters that I plan on fleshing out some day. 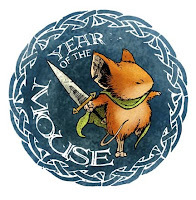 Don and Joanna Corcoran, who are developing a Mouse Guard Board game, have declared this not the year of the rat, but rather, of the mouse. One of their many game-related sites: The Reality Vault, has a post about it and some of their plans to make the year plenty mousey. Thanks for all your time and support Don & Jo! The next few weeks are going to be exciting, and they only mark the start of what will become convention season. 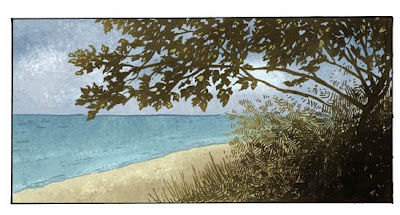 -Wednesday 3-26: The Villard edition of the Mouse Guard softcover will be out in stores. It's pretty exciting to have an imprint of Random House wanting to publish your comic work. -Monday 4-7 @ 7:30pm: Schullers Books talk and signing. The lovely folks at this independent bookstore asked me to come and talk about comics and sign some of the new Villard edition of Mouse Guard. Come on out and chat if you are in the area. e-mail and a scan of his color pencil work. Thanks Bo!! I will be appearing today at Mott Community College in Flint, MI (my home town) today Mar. 4th (the only day of the year that is also a command) from 11am-2pm at the Phral Center . If you are in the area, hope to see you! I'll have books to sign, answer questions and if time permits, I may do some sketches.